Preheat oven to 190°C. Heat oil in a large frypan and add onion and garlic. Saute until onions are soft. Add mince and fry until just browned. Add the crushed tomatoes, oregano and cinnamon. Simmer for 5 minutes. Add the rice and simmer for 15 minutes over a low heat. Cut the stem end off the capsicum to expose the seeds inside. Remove the seeds and membrane from each capsicum, then place capsicums in a baking dish that will fit all 6. 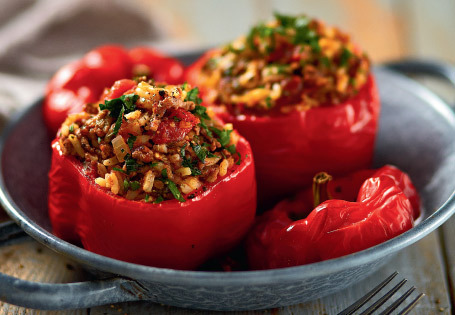 Fill each capsicum loosely with the meat mixture and replace the capsicum top. Pour the stock into the baking dish so it surrounds the base of each capsicum. Cover baking dish with foil and bake for 1½ hours. Check that rice is cooked, if not, return to oven for a further 15 minutes. Serve immediately.